Full disclosure, everyone: I absolutely love Laos! After coming away from the very beautiful but also very loud, dirty and crowded country of Vietnam, Laos was a complete breath of fresh air. My first stop was in Luang Prabang, which is well-serviced by an international airport and is also located along several bus and ferry routes. I got a very last-minute flight here from Vietnam for under $200, and was able to take a tuk-tuk to my hostel for $3.50 ($7 flat fee from the airport, which can be split between a maximum of 4 people). 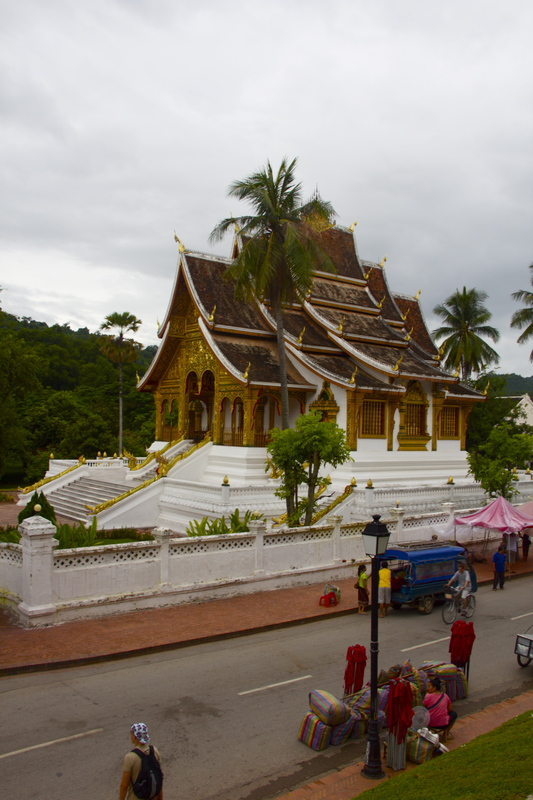 Luang Prabang is a small, wide-open city located in northern Laos, a former French colony. Situated along the banks of the Mekong River, this UNESCO World Heritage city offers a beautiful mixture of natural and man-made attractions, including waterfalls, river cruises, temples and markets. Compared to other major Southeast Asian cities, Luang Prabang has long, wide streets that are generally sparsely trafficked and are perfect for walking, biking and motorbiking. 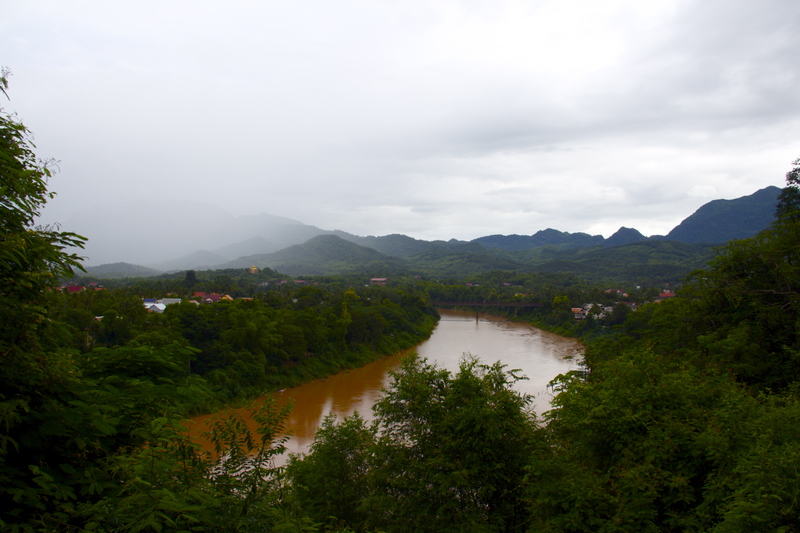 I only had two days in Luang Prabang, and although I saw most of the things I wanted to see, I definitely could have spent more time there. In the rainy season, note that you will probably only get a half-day of decent weather per day, so plan accordingly and expect to have a lot of time to relax! During the rainy times you can go to one of the many spas, enjoy a long meal in the pop-up restaurants along the riverside, or have a smoothie or drink at Utopia bar, which offers sun-beds and good views of the river from above. Sunbeds on the river at Utopia. If the weather is permitting, take a half-day to go see the Kung Si waterfalls outside of the city. A tuk-tuk roundtrip costs about $5, or 40,000 kip. Entry to the waterfalls is not included, and costs about $2.50 extra (20,000 kip). I would suggest leaving on one of the 1:30 pm tuk-tuks, then taking the return at 4:30. This is plenty of time to see the falls, with an included trip to a bear sanctuary on the way up to the falls. You can spend the day hiking up the waterfall, which is steep but provides decent views, or simply swimming in some of the lower pools, which I would recommend for those who are less fit or who have leg/foot/knee injuries. The best view of the falls is located just before the ascent to the top, where you can take pictures from the bridge. During the second day I would highly recommend renting a bike, which costs about $2.50 for the day (20,000 kip). Riding the bikes is a great way to see the town itself, even if you don’t have a destination in mind. This is also one of the best ways to see all the temples in the area, including the majestic Golden City Temple (Wat Xieng Thong) and the elevated Wat Pa Phon Phao. The views from the top of Wat Pa Phon Phao are stunning and highly recommended. You can also easily see the National Museum and the Handicraft Village, which I unfortunately didn’t make it to as it started to rain. My favorite thing to do was the Night Market, which offers some of the standard touristy souvenirs and also some amazing food. I ate there every night and always had something new and different for pennies, and also took home some amazing teas, a tote bag and a scarf. Its very easy to haggle the vendors down, and I’d suggest asking for multiples for a much cheaper price or asking for a single item for about 75% of the original price. Usually you’ll end up somewhere around half or less of the original price offered. This rule generally does not apply for food. Getting around Luang Prabang is super easy as the town isn’t very big. You could walk to most places within an hour, but renting a bike can be much faster and more fun. As stated above, bike rentals cost about $2.50 per day (plus a deposit). You could also get a tuk-tuk to take you around, for whatever price you can haggle! If it seems too high and your driver won’t budge, just say no thanks and try walking away. Usually you will get the price you ask for. As a budget traveler, I stayed in a hostel called the Khammany Inn Hostel, which cost about $5.50 per night for a dorm, $7.50 for a private room. The rooms were decent, but less nice than some other hostels I’ve stayed in. All the same, they had aircon, free breakfast and an adorable puppy running around, so it was a pretty decent stay. On the downside, I had my laundry done there and all of my underwear and several of my tops went missing, so don’t do your laundry through the service offered there! Its also much cheaper to get it done elsewhere, and if you look around you should find a place that will do it for 8,000 kip, or about $1. Always and forever eat dinner at the Night Market. There are a few quick options right from the start, but if you walk down half of a block to a small alleyway you’ll see long rows of food vendors. 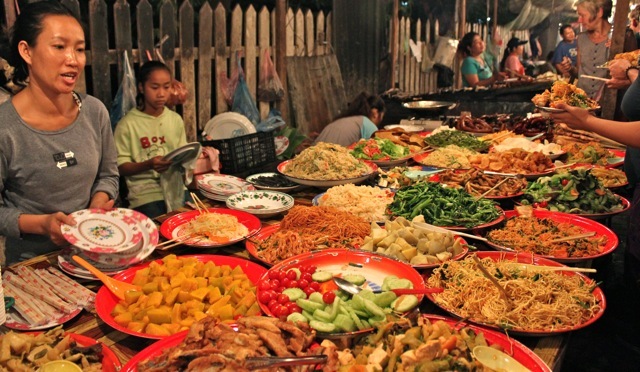 Go there and check out the buffets– for 10,000 kip (~$1.25) you’ll get an all-you-can-eat plate full of local foods. You can also get freshly grilled meat for an extra 10,000 kip (~$1.25), which I’d definitely recommend. Once you’ve finished your main meal, head back up toward the market, but stop to sample some of the barbecued dried pork (5,000 kip (~$.75) per full serving, which I guarantee you’ll want!) 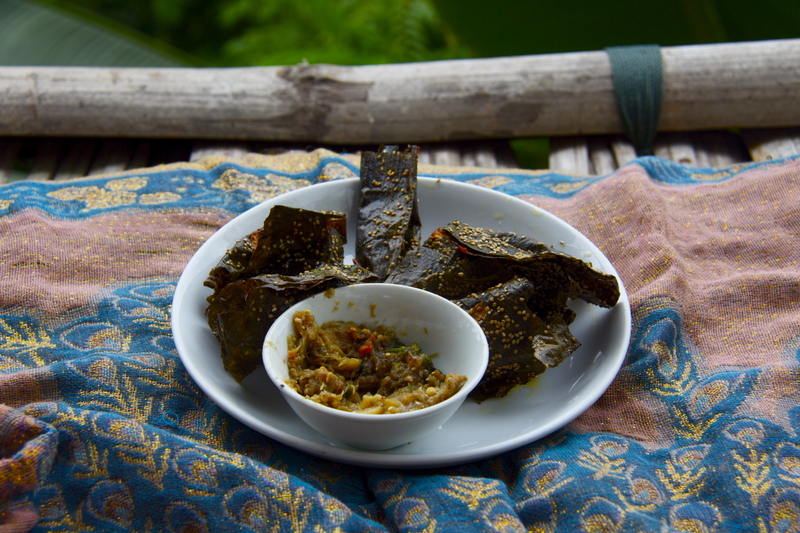 and their coconut discs, which are made with rice flour and coconut for dessert. Photo credit: seeyousoon.ca! Check out her blog, its amazing! During the day time you can also get quick bites to eat on the same street, with the fruit shake/crepe/sandwich vendors standing permanently in the same place as they do at night. Most shakes are 10,000 kip ($1.25), sandwiches and crepes may be slightly more. Utopia also serves some pretty decent foods of local and Western varieties, but their service was definitely more than a little lacking in this department, so I’d suggest trying to find a little local pop-up restaurant instead. Utopia is really the only good place for young backpackers to go and drink, and you’ll see most everyone from your hostel there. Earlier in the evening, Utopia has a very relaxed vibe, with sun-beds and shisha available, while later in the evening it gets a little rowdy. Utopia does close at 11 pm, though, so its important to get there a little bit on the early side. After Utopia, some people go bowling (tuk-tuk drivers are happy to take you there), but you can opt to go home and drink there instead. 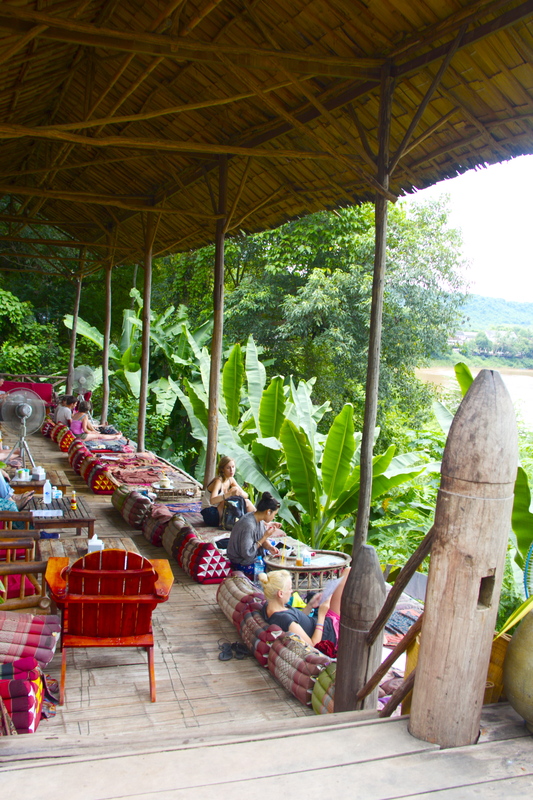 Overall, Luang Prabang was an awesome hit for me. 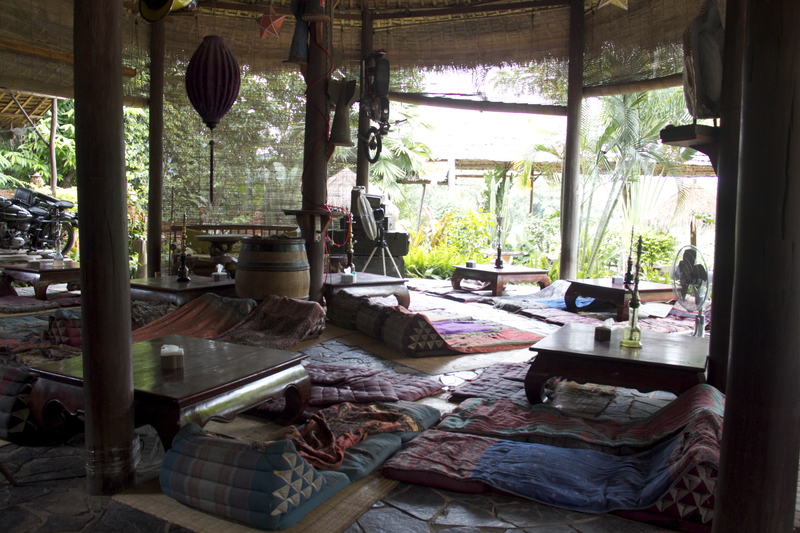 I loved every second of being there, and could not get enough of the relaxed, unpretentious atmosphere. Take it at your own time and remember the popular pidgin’d acronym for the country’s name: Lao P.D.R- Please Don’t Rush! Next Post Baby Tiger Playtime in Chiang Mai, Thailand!